For an alternative cruising experience, Arctic voyaging offers an intimate perspective of the stark and beautiful far northern landscapes that are fast disappearing. Although the cruise has largely been associated with holiday voyaging through such deep blue, sun-blessed waters as the Mediterranean or the Caribbean, a newer, hardier breed of cruiser is emerging that instead favours the chillier and starker environs of the Arctic region. This new niche vacation that has coincided with the growth of adventurous holidays and increasingly popular with Brits is not holiday cruising, but expedition cruising. Now seasoned cruisers have become weary of the sun-lounging, cultural tours and cabaret shows of their traditional waterborne holiday and now seek something more challenging. These expedition cruises cater to a new demographic, one younger, more adventurous and attracted by the wildlife – which include beluga whales, polar bears, walruses and caribou - dramatic polar scenery, and sheer remoteness of the Arctic. The differences are not limited to the destinations. In accommodating less than 200 passengers, expedition cruisers are much smaller than the average cruise liner and as such are able to offer a more intimate encounter with the surroundings. On board on a relatively small vessel passengers can, for instance, get much nearer to the ice face and get a much stronger idea of the immense size, power and majesty of this natural environment. Experiencing the polar region is not limited to observing from deck. Arctic cruises also encourage greater immersion in their surroundings with the aid of on board lectures and daily land trips in kayaks or rigid-hulled inflatable boats. Whereas Antarctic cruising is now a significant industry with a reputed 30,000 visitors over the last summer, the Arctic cruise scene is still very specialist, and mercifully undeveloped. 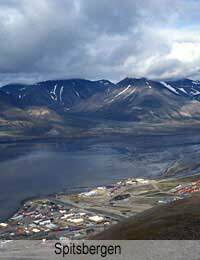 The centre of cruising activity, for Europeans at least, is around Svalbard, the starkly beautiful archipelago 400 miles north of mainland Norway and only 600 miles from the North Pole itself, and its chief embarkation point the island of Spitsbergen. Fed by the warm northbound Gulf Stream current, Spitsbergen enjoys a much warmer climate than one might expect, and is much more hospitable than other polar settlements at similar latitudes. During the short two-month summer season the average temperature is 6°C. Those cruising around the archipelago - a similar size to Ireland and 60% covered in glaciers - are treated to dramatic coastlines with stunning backdrops of soaring mountains and glaciers. Aside from the few thousand inhabitants the area is home to the Svalbard reindeer, the Arctic fox and a great many polar bears. Whales, dolphins, seals and walruses populate the surrounding waters. Arctic expedition cruises are not limited to this northern Norweigan area but can also take in Greenland and northern Canada, another popular centre for Arctic cruising. It is even possible to visit the North Pole itself on an icebreaker cruise. As Svalbard is so far north of the Arctic circle it not only experiences the natural phenomenon that is the midnight sun, where the sun never sets, but does so from late April to late August. This offers a perfect ‘season’ during which to visit the area on a cruise.Most visitors from the UK arrive in the second half of June until to the first half of August, as this is when the archipelago is at its warmest. It is an irony that those wishing to appreciate the beauty of the far northern reaches are finding it increasingly easy to do so at its expense, as the destructive impact of global warming takes its toll. There is great concern that the increase in tourism – which has already been especially pronounced in Antarctic – will encourage the further demise of this otherwise remote wilderness. The need for strong regulation so that trips only take place in small numbers and in specially equipped vessels has so far led to the formation of the Association of Arctic Expedition Cruise Operators, which is dedicated to safe and environmentally friendly cruises in the Arctic. If we are unable to protect this beautiful landscape from the effects of global warming then hopefully this will at least guard the northern extremes being spoilt by the vast cruise liners that are familiar sights across the planet's warmer climes.